Come and check this award-winning model home by Taylor Morrison near the heart of Beacon Park in Irvine's Great Park. 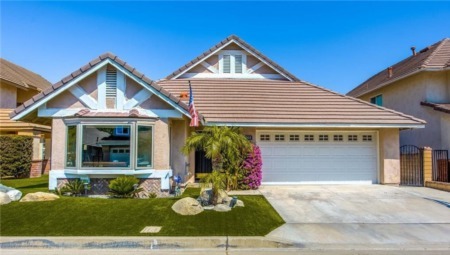 This Fully upgraded model home is currently MOVE-IN Ready. Located in the new development parts of Beacon Park, this contemporary-style residence house has much to offer. With its Bright and Open floor plan with a contemporary touch, the home boasts about the beauty of modern day convenience living. The home's spacious living room offers various entertainment including built-in ceiling Bluetooth surround sounds for parties and late night movies. The home's over-sized lovely kitchen island, extensive counter space, cabinetry, pantry, and stainless appliances meet all your inner gourmet food art in our upgraded kitchen. Accompanied by gorgeous wooden flooring downstairs leading to the cosy backyard where you can enjoy pure relaxation in the BBQ bar and patio sets. This home features an individual bedroom downstairs with its own living room, full bathroom, and own entrance to your room. Relax & recharge in your luxurious master suite with spacious walking closet, Generous-sized upstairs laundry room enriches your life & your home's value & offer comfortable living space for the entire family. This amazing house offers resplendent views of the neighbourhood through the multitude of windows that offer ample illumination to brighten your day. Come and claim this dream house in Irvine's Great Park as this is a home you do not want to miss out on! SchoolsClick map icons below to view information for schools near 101 Newall Irvine, CA 92618. Listing provided courtesy of Jie Yan, Mcsen Realty.